Way back in 2009, my friend, who by the way now has a German passport, took me to a restaurant in Frankfurt and summarised German cuisine in one line; steamed pig between the buns and a beer! Clearly, there is so much more to food in Germany that my poor little friend didn't try. Now in 2017, he understands a lot more about the food. Even back then, there was so much to try in Germany, from schnitzel to street side steak, but I didn't have a chance to go back to Germany. In Colombo, a German pub has been getting raving reviews and I wasn't going to miss it. Pubs, apparently have to be German or Irish. I believe everything else is a derived from these two pub forms. While there is no real way to establish that statement, the Bavarian in Colombo has a distinct German feel to it. The way the tables are arranged to the colour of the dim lights and the (rather expressionless) waiters, it did feel like being transported back to 2009. 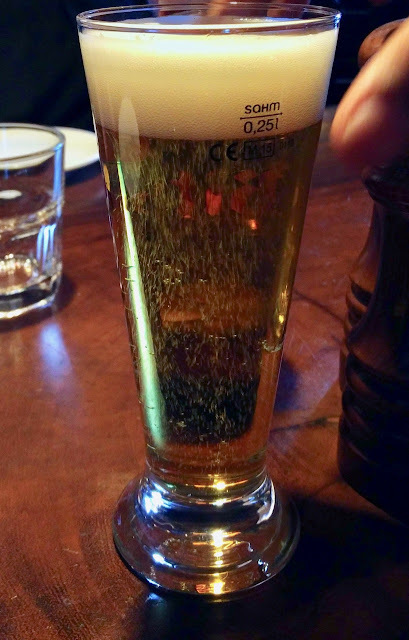 With the arrival of different beers in different (or rather their respective) beer glasses, the ambiance was complete. The food was definitely more than steamed pigs between the buns. 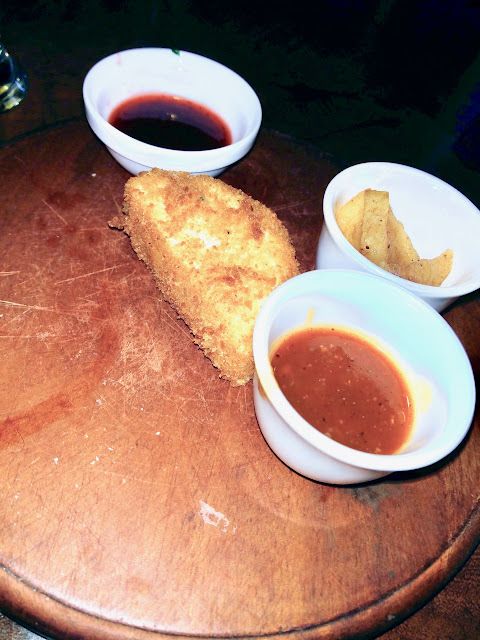 The fried camembert cheese with stewed apple and chutney was a fabulous start to dinner. This fried gooeyness with sides was so good that we ended up ordering two more for the table of five. That was because the portion size of the mains were yet to be revealed. All of us shared some Beef Goulash soup, a soup with chunky beef in a thick mildly spiced broth. When we saw a 400g Woodcutter steak on the menu, we knew it was large and decided to share one between us, but our friend said he was hungry and he ordered one for himself. 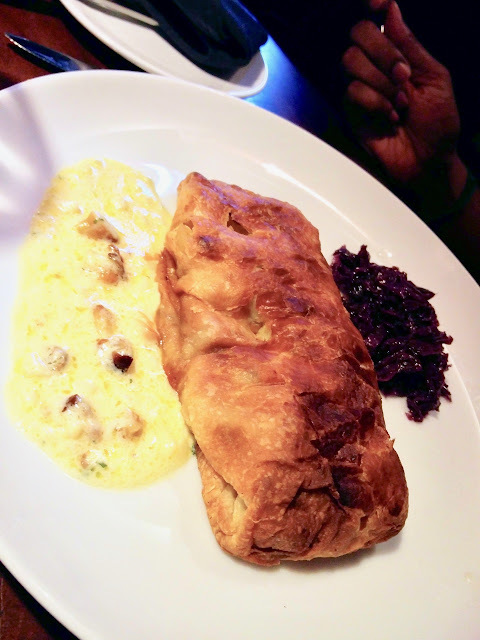 A 'Tuesday vegetarian' friend got himself a potato roulade, and beef stroganoff with noodles for the fifth person completed the order. The beef steak was huge. Our 6'2" friend who ordered one for himself finished it, but had to be rolled out of the restaurant. The two of us who shared another, barely finished it. The steak itself was beautifully pink, with a thick mushroom sauce to complement it and some veggies to complete the plate. I only had a bit of the roulade and while I don't remember the flavours I do remember commenting that it was good. I also don't remember if I really liked it or if I said that to console my 'Tuesday vegetarian' friend whose eyes I noticed were staring at all our plates. 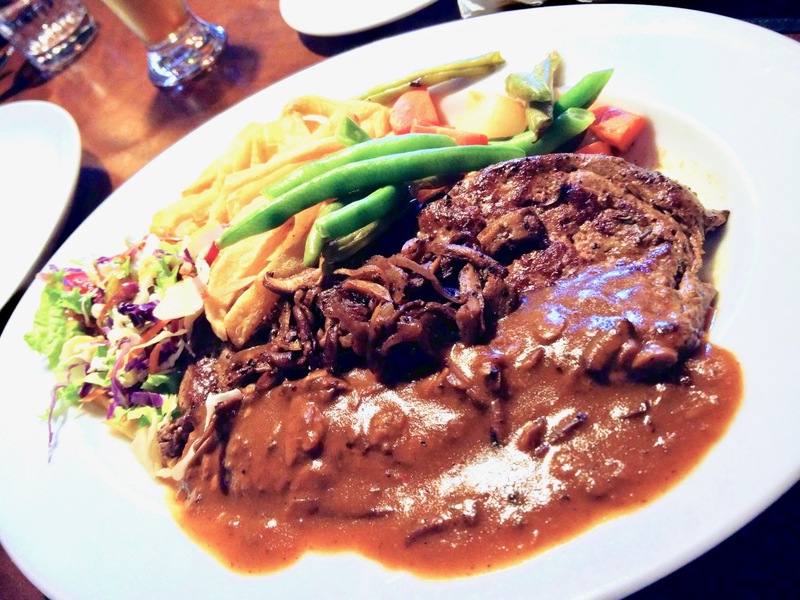 The stroganoff beef dish was similar to the steak, but the beef strips was well done. The noodles that came with the stroganoff was funny, it felt more like a cross between pasta and potato than noodles and was bland, but to its credit it did complement the stroganoff. I know we were full, but we binged on dessert here. Crumbled Apple stew was beautifully crusty and the full flavour of the apples coming through with ice cream cutting the heat, was the dessert of the day, followed closely by the Snicker Mousse that was thick and decadent with various combinations of chocolate. 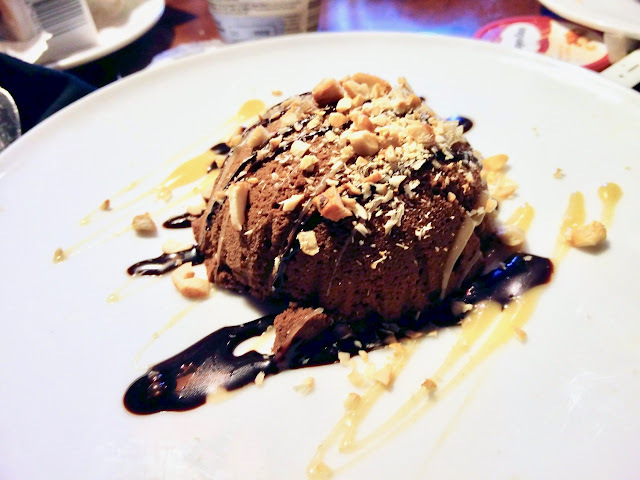 A couple of ice creams with macadamia nuts completed our dessert. Our host foot the bill and so I don't know what the total damage was, but the dishes were priced reasonably well (for Indian standards). The woodcutter steak at about LKR 1650 (about INR 750) and the starters at about LKR 950 (INR 400), the final bill should have been around Rs. LKR 15,000 (about INR 6500) for five people. 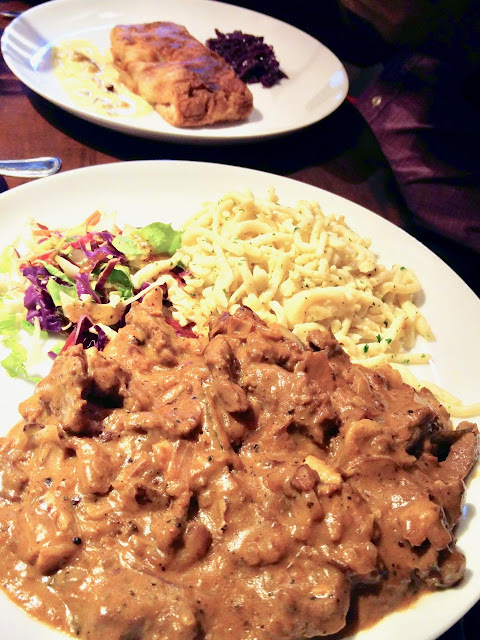 With large portions, a German like ambience and nice peppy music, Bavarian should be a must visit while in Colombo. Bavarian is in Kollupatiya, Colombo.